Labour’s Keith Hunter has been elected as the new police and crime commissioner for the Humberside police area. Mr Hunter, a former superintendent, pipped incumbent Tory Matthew Grove to the post with an overall majority of 24,353. Labour supporters had heralded Mr Hunter’s victory well before the results of a second preference count were revealed. In total, Labour totaled 76,128 votes and the Tories fell behind at 51,775. Addressing supporters and opponents at Bridlington Spa, where the count took place, Mr hunter said: “I would like to thank everyone who voted for me and I realise they were not all Labour supporters. “I realise I have won, because people are worried about policing and they want to see some changes. “Of course this election follows closely with the findings of the Hillsborough Inquest. “Tragic events, such as Hillsborough, should give serious pause for thought. “But I don’t believe people should use such events, from 26 years ago, in another police force area, to imply that all police officers are somehow forever tainted and obviously biased simply because they are police officers. “I have stood up to bullying and arbitrary use of power all my adult life. I promise I will continue to do so - no matter where it occurs. That’s where my values lie. UKIP’s candidate, Michael Whitehead, came in at third place while the Liberal Democrats’ Denis Healy was last and bothe were ousted after the first round of counting. Disappointingly, voter turnout increase only marginally to 22.84 per cent, from 19.15 per cent during the 2012 election. Alan Billings was comfortably returned as the South Yorkshire Police and Crime Commissioner. Labour candidate Dr Billings received 144,978 votes and will remain in position for the next four years. David Stewart Allen, English Democrats, received 19,144 votes, Gavin Felton, UKIP, received 19,144 votes, Joe Otten, Liberal Democrat, received 28,060 votes and Ian Walker, Conservatives, received 29,904 votes. Dr Billings, a former parish priest and was deputy leader of Sheffield City Council in the 1980s, said it was his aim to make South Yorkshire Police an ‘exemplary’ force over the next four years. Dr Billings won a by-election to become crime commissioner in 2014 following the resignation of Shaun Wright amid the Rotherham child sexual exploitation scandal. He was on the shortlist to be Labour’s candidate for the PCC post in 2012 but Mr Wright was chosen ahead of him. In Sheffield 133,772 votes were cast in the crime commissioner elections, which is 34.4 per cent of the 388,850 electorate. In Doncaster 43,915 votes were cast, which is 20.14 per cent of the 218,043 electorate. In Rotherham 64,267 votes were cast, which is 32.64 per cent of the 196,887 electorate. In Barnsley 44,804 votes were cast, which is 26.64 per cent of the 175,698 electorate. 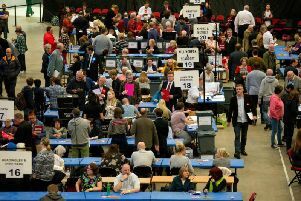 The election count for who will be West Yorkshire’s next police and crime commissioner is continuing after no candidate won enough votes in the first round. Labour’s Mark Burns-Williamson and Tory Allan Joseph Doherty are still in the running after they got the most first preference votes. Mr Burns-Williamson, who has held the PCC post since 2012, got 260,271 votes West Yorkshire-wide. Mr Doherty got 119,336 votes of first preference votes. Mr Burns Williamson narrowly missed getting half the vote, at 49.67 per cent. But because he did not get 50 per cent or more, second preference votes are being counted to decide the result. Mr Doherty got 22.78 per cent of first preference votes. The three remaining candidates are eliminated from the contest as the count resumes. They were UKIP’s Peter Corkindale, on 14.27 per cent, Barry Stewart Golton for the Lib Dems, who got ​9.34, and Therese Hirst of the English Democrats, on 3.94 per cent. YORKSHIRE’S POLICE COMMISSIONER ELECTION RESULTS IN FULL. Please refresh page for the latest version.